A) First we will need a flower. B) Using your scissors, carefully take the flower apart and set them on a sheet of paper towel. C) Cut the carpel in half so you will see the inside. D) Look at a drawing of the parts of a plant and identify each part (pistil, stamen….) in your flower. 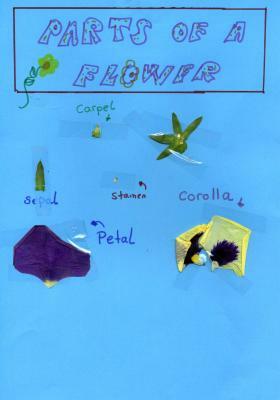 E) In a nice paper write the title “Flower dissection” stick every part of the flower and write the names. Perhaps it is easier to use cello tape to protect it.